Update – Reclaiming the Mass Grave of inmates of the Good Shepherd Laundry and Industrial School. An Bord Pleanala have granted permission for the redevelopment of the site and our objections and observations regarding the women’s grave and active memorialisation (in the Bakehouse interpretive centre) have been upheld. Condition 5 of planning has guaranteed consultation with survivors. I have sent a formal / official request to assess the possibility of leasing lands on Sunday’s Well to a management company – (to be established) in order to create a Memorial Garden and access to graves of those buried adjacent to the site of the former Good Shepherd Convent, Laundry and Orphanage. The Management Company will include survivors, their family members and specific experts. I personally guarantee that every effort will be made to ensure the project is fully participatory with survivors. I am waiting until I have some kind of formal approval before I call public meetings because I do not want to burden or disappoint anyone. Our motivation is to gain access to the graves of persons who lived and died in the Good Shepherd institutions. 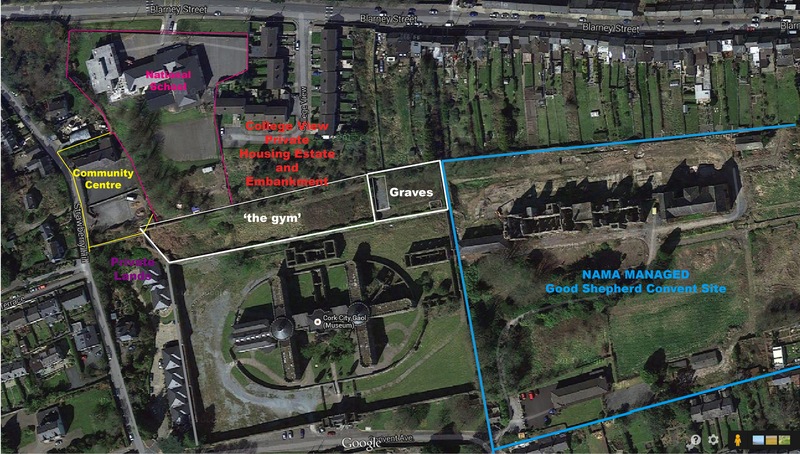 The site includes the area known as ‘the gym’ and the walled in graveyard adjacent to ‘the gym’. The grave(s) cannot be accessed at all due to the high, 8-20ft, walls and locked gates which surround it. At least 30 women are buried in the mass grave (but records show evidence of more burials) and there is a second unmarked plot on site. The area is land-locked, surrounded by; the Gaol, private housing & lands, the National School, the Good Shepherd site and the Community Centre on Strawberry Hill. The site is 30-40 ft above the women’s Gaol with a low wall acting as the only barrier to protect people from falling the distance to the Gaol – this wall has collapsed in some areas. Access can be created via the community centre could be made and this would be relatively flat and accessible. Boundary between Community Centre, private property and ‘the gym’ site to be established (I am checking with Land Registry) – this boundary will be crucial in terms of access. An elevated ‘walk’ runs along the back of the site including the graveyard and ‘the gym’, behind which there is a low wall leading to the embankment. Current status of the site: The lands are held in Cork City Council Titles and the site is leased to the Gaol management as part of the heritage site. Access via Blarney Street and Surrounding Areas Community Centre/ Association is desirable as the centre’s lands are at a similar elevation to ‘the gym’, to which it is adjacent. The community centre management and National School principal are in general agreement with my proposal and have indicated a desire to co-operate with the project. We are going to hold talks in September when the school returns to full working hours. The school management are looking into creating an outdoor kindergarten but have assured me that they will not stand in the way of a Memorial Garden. The Cork City Gaol Trustees are supportive of the project in principle but many safety and security issues need to be addressed. Our main goal is to gain access to the graves on the proposed site. It is our hope that the creation of a Memorial Garden at this site will be highly beneficial to our society, survivors, survivor families and the tourism sector. A Memorial Park (concept changed to Survivors Community Garden, 2017) would be a generous and powerful gesture of reconciliation to laundry and orphanage survivors. It would also make for an incredibly beautiful park with clear vistas of Cork, located in a tranquil area. There are many such graves around the country and Cork City Council are well placed to pioneer this model of these sites as historic memorials. It would be very important to our group to design the park in collaboration with survivors and with practical input from relevant council authorities for health and safety requirements. This entry was posted in Uncategorized and tagged adopted, adoptee, Cork City Gaol, human rights, institutional abuse, Ireland, Irish, magdalene, mass grave, orphan, orphanage, planning, stolen babies, Sundays Well, survivor, women on July 29, 2014 by maureenconsidine.